Hello Ali Haider , and welcomed to our blog . 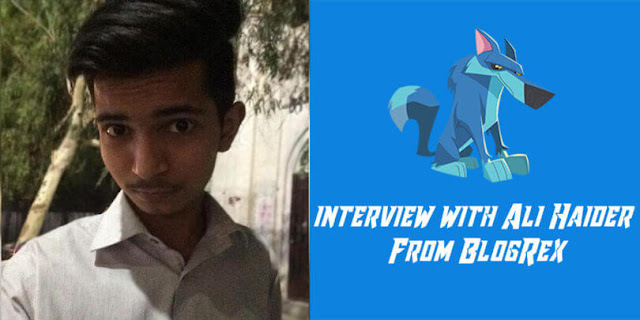 It is great honor for me to take an interview of such a talented blogger. Danial, First of all I’d like to thank to invite me for the interview. My name is Ali Haider. I’m 16 years old and belong to Faisalabad, Pakistan. I’m founder of BlogRex. Q#1: How did you start blogging? I’m very fond of such kind of things since my childhood. In 2010 I came to know that one can make a free website on Blogspot. So I started my blogging career from there. Firstly free domains and host then I started to get payment for this. Q#3: Who is your role model in this field? Q#3 :Which was the happiest moment in your life? Ummmm, usually everyday is a happy day for me but one day I thought every person has his own ranking technique….. Why don’t I make my own technique. Though I made my own ranking technique. When it worked then within 4 or 5 days my post was ranked on the keyword😃. I was so happy on that day. Q#4: Which blog do you visit almost daily? Backlinko.com is a very good blog and my favorite too. So I check this blog daily. Q#5: Please tell us about your daily routine? Q#6: Have you earned money from internet? Share your result. Q#7: Are your parents satisfied with blogging? No, they are not and say me, you spend all the time with laptop, you should go outside too. Q#7: What is your future plan? According to my future plan I want to be a top class blogger by the next 5 years INSHAALLAH and want to beat every professional blogger. I want to be such a brother of my sister that she should be proud of me. Q#8: At last, would you give some advice to new bloggers? Sure! I’d say to all new bloggers whenever u take up your blog first of all select a niche. Ask this question to yourself. Who are you? In which field you are best? Then research the keyword properly. Write the content on your own and don’t copy to anyone. Keep patience while doing SEO because ranking takes time. Some people don’t wait and give up. Thanks Ali Haider for a wonderful interview. Share this interview with your blogger friends.